Ok, so I’m about to alienate all readers who don’t have kids right now – but hang tight for a second! If you stick with me here, I think you’ll find some valuable lessons in personal financial planning. We can all use some guidance when it comes to personal finances and getting a handle on our money. It just so happens that my daughter’s favorite cartoon character, Dora the Explorer, can be a pretty good personal financial planning guide. So let’s turn to Dora and find out her 5 things we need to know about personal financial planning! For those familiar with the show you’ll know that Dora’s always on an adventure. She always needs to get somewhere to help someone or make it to a birthday party etc. Dora always has a specific goal she is trying to reach. We need the same thing when it comes to personal financial planning. If you don’t know what you’re aiming for – whether it’s retirement, opening a Roth IRA, debt-freedom, a new house, college savings or something else – then you’ll never reach your goals! Question: Do you have specific and targeted goals? In order to get where she needs to go, Dora enlists the help of Map! Yeah, a not-so-clever of a name, but hey the target audience of the show is young kids – give ’em a break! Anyways, Map comes on to the scene and shows Dora how to get from point A to point B. He tells her where she needs to go and what to watch out for. A personal financial plan or a tool like this Credit Card Payoff Calculator will lay out exactly what you need to do and when so that you can get to where you want to go! Question: Do you have a personal financial plan? 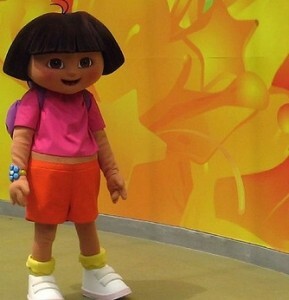 Inevitably in the show, Dora runs across some sort of challenge and she needs to use some tools or items to help. But guess what, Dora is prepared! She always wears her trusty Backpack! Backpack comes in, sings his little song and then opens up to reveal all kinds of tools at Dora’s disposal to help her stay on track! We need to be prepared for the “What Ifs” in life. We need to have emergency funds, we should really have the proper amount of insurance, and of course, we should really spend some time thinking about things you shouldn’t be caught dead without! Question: Are you prepared for life’s “What Ifs”? Dora’s got lots of friends! And they are all willing to help her out. This is extremely important, especially when you are on a long and difficult journey like climbing out of credit card debt! Any time we’re trying to reach our goals, we’ll be tempted to lose focus or just plain quit! This is where accountability and friendship come in to play. Enlist the help of someone who won’t be afraid to challenge you and keep you accountable to your goals. If you don’t share your goals with anyone, you are less likely to reach them. Get by with a little help from your friends! Question: Do you have people who can help you in the journey? Personal Financial Planning Tip #5 – Identify and Get Rid of the Swipers! If you’ve never seen the show, Swiper the Fox always makes an appearance! He loves to knock Dora and her friends off track, take something that doesn’t belong to Him or just plain mess up the adventure. Dora and her friends get rid of Swiper by yelling, “Swiper, no swiping! Swiper, no swiping!” and eventually if they say it soon enough he leaves! I guarantee you that you WILL have Swipers that come to knock you off track! It might be in the form of a new outfit calling your name, a new car that is begging you to buy it or it might just be your credit cards that missed being swiped! Swiper might even be you!!! Be ready to say, “Swiper, no swiping” to yourself!! Question: Do you get rid of the temptations that throw you off track? Readers, what other tips do you have? What tip has helped you the most in your personal financial planning journey?